NOAA has led, for 28 years, a team of international scientists in issuing annual reports on the state of the climate focusing on the year just passed. The State of the Climate in 2017 report was published as a supplement to Bulletin of the American Meteorological Society in August 2018. Nine Federal, JISAO (Joint Institute for the Study of the Atmosphere and Ocean, University of Washington), and JIMAR (Joint Institute for Marine and Atmospheric Research, University of Hawai’i at Manoa) scientists resident at PMEL co-authored four of twelve sections in the Global Oceans chapter and two of ten sections in the Arctic chapter for the report. In addition, Dr. Gregory Johnson served as lead editor of the Global Oceans chapter and participated in the media roll-out event. Dr. Johnson’s overview for the Global Oceans chapter noted that while global mean sea surface temperature was slightly lower in 2017 than in 2016, ocean heat content and sea level both reached record high levels in 2017. The ocean heat content section of that chapter, led by Drs. Johnson and John Lyman, also noted that upper ocean heat content in 2017 was higher than the long-term average in most regions, with the western tropical Indian Ocean and the North Atlantic values lower. The sea surface salinity subsection, authored by Drs. 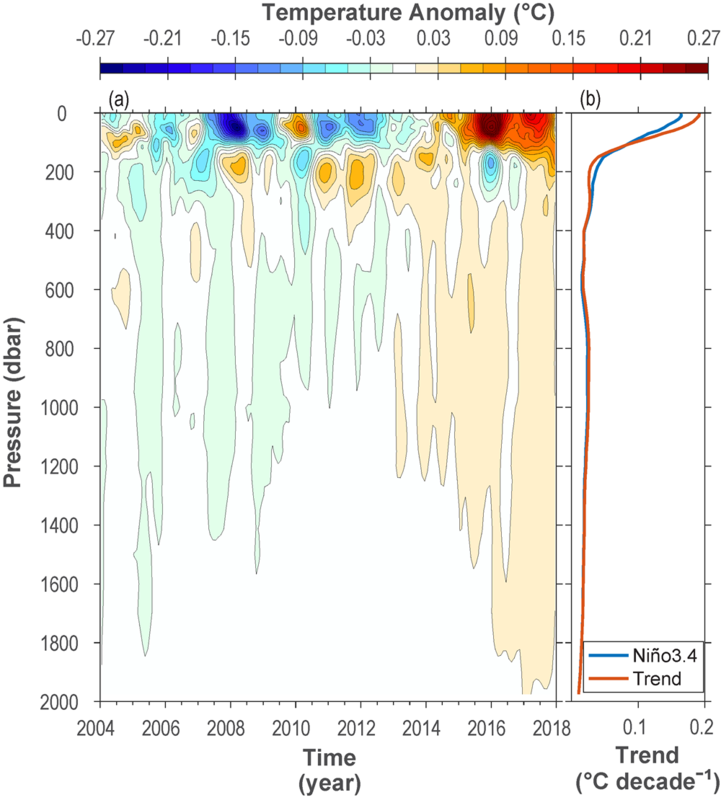 Johnson and Lyman, documented changes in surface salinity patterns including freshening in the western tropical Pacific and salinity increases in the eastern tropical Pacific, consistent with continued Neutral to weak La Niña conditions. The ocean carbon section, authored by Drs. Richard Feely, Brendan Carter, and Adrienne Sutton noted the general increase in uptake of anthropogenic carbon by the ocean from the 1960s to the present, with about 2.6 Pg† taken up in 2017. Drs. James Overland and Muyin Wang were surface air temperature section authors for the Arctic chapter, and noted warm 2017 air temperatures at land stations in the Arctic (surpassed only by 2016). Finally, Drs. Carol Ladd and Kevin Wood were sea surface temperature section authors for the Arctic chapter, which focused on August conditions.